The Getreidegasse near the cathedral is Salzburg′s busiest lane: one super-expensive boutique next to another show that the average tourist visiting Salzburg in a group or backpacking via "interrail" is definitely not the type of person that keeps the city going. The stores in the Getreidegasse make most of their money with the rich guests of the Salzburg Festival. It is unclear what the name "Getreidegasse" is derived from - "Getreide" means "cereal", but this is no option since the medieval name that was partly used up to the 19th century was "Trabegasse" ever since 1150. It has been a major road since Roman times, when Salzburg was still known as Iuvavum. Up to the reign of Prince Archbishop Wolf Dietrich von Raitenau, the Getreidegasse was the only major road across Salzburg and towards Bavaria. This made it the best neighbourhood of the "Bürgerstadt" in Salzburg and it was here that doctors, breweries, rich merchants and wealthy craftsmen lived. The Getreidegasse is also known for the Mozart birthplace in the Hagenauerhaus. The Mozart family had rented a flat in the house of the wealthy merchant Lorenz Hagenauer. The Keutzl family lived at the beginning of the Getreidegasse. Their house bears a "Geschlechterturm" ("House′s Tower"), and it served as the town hall of Salzburg since 1407. 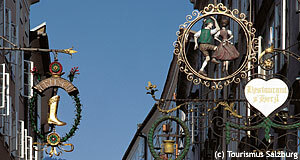 This house is still known as "Altes Rathaus" or Old City Hall. There was a charity bathhouse, in which poor people could have baths and basic medical treatments for free three times a year. Salome Alt, the concubine of Prince Archbishop Wolf Dietrich von Raitenau, lived in the Getreidegasse. The Getreidegasse was kept neat and tidy in a rather peculiar way: every Saturday and the days before holidays, the water from the Almkanal (check it out on the Universitätsplatz in front of the Kollegienkirche) was used to flood all the alley and wash all dirt down to the Salzach river. Desperate measures like that were probably urgently necessary: most of the picturesque arcades and inner courts that are occupied by posh shops used to be stables and storage space. Today, the Getreidegasse is often that crowded with thousands of tourists, that visitors might wonder whether anybody lives here that doesn′t sell tacky Mozart souvenirs or "Sound of Music" memorabilia. In general, it is seen as the most exclusive shopping lane in Salzburg. Alas, there are "real" people who live in the Getreidegasse - beyond the ground floor, many houses are residential and flats often occupied by middleclass families or even students. Most locals from Salzburg, however, know how to avoid the Getreidegasse at least during the summer months.